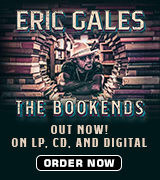 If you like blues harmonica, this is the album for you. 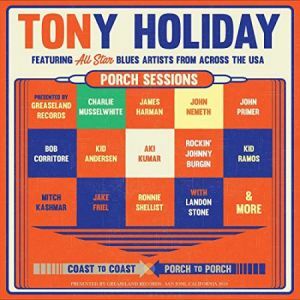 Recorded in informal settings across the country,Tony Holiday and his traveling companion, guitarist Landon Stone, made various stops to play with a number of celebrated blues artists, with Holiday being one of the nine harmonica players featured on the project. Holiday has honing his talents over hundreds of live performances in recent years, cutting several releases with his band, the Velvetones. James Harman gets things started with his usual fine vocal on “Pick-Pocket Fingers,” a lively song that certainly sounds like one of his originals, but the notes to the disc lack songwriter credits for the program. The presence of Kid Ramos on guitar is an added bonus but Stone takes the guitar solo, with Harman shouting out encouragement. While the notes state that Holiday is on every track, Harman is the lone harp player on this cut. Two other tracks feature Harman and Ramos. “Special Friend” finds Harman bemoaning his bad luck with women, then Holiday and Ramos give their musical responses to the singer’s situation. Harman undoubtedly had a hand in writing”Goin’ To Court,” a swinging track pushed along by Holiday’s hard blowing. 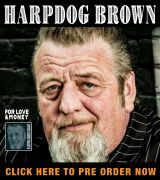 “They Call Me John Primer” is a grinding shuffle with the celebrated Chicago bluesman’s gruff vocal framed by his frequent associate, Bob Corritore, who once again displays his mastery of amplified harp tradition. The pace picks up considerably on “Tell Me Baby,” thanks to Joel Meza Jr. on drums. The music shifts back and forth between the twin pairings of amplified guitars and harps. The standard “That’s Alright” has Kid Andersen on upright bass and Alex Pettersen on drums, backing Charlie Musselwhite and Aki Kumar, with Rockin’ Johnny Burgin on guitar. Kumar takes the lead vocal on the longest track on the project, giving everyone a moment in the spotlight. Little Sonny’s “Woman Named Trouble” gets a funky backbeat compliments of Danny Banks on drums, joined by fellow Blue Dreamer Matthew Wilson on guitar, Their boss, John Nemeth, shares the vocal slot with Jake Friel, a fine player of a younger generation, and both men have plenty to say on their harps. Nemeth is back for “Blues Hit Big Town,” sending out a brief tribute to Junior Wells, one of the main influences on his career. Mitch Kashmar takes over on “Becky Ann,” using a gritty vocal tone to pledge his love, then trading gripping harp lines with Ronnie Shellist. The duo go it alone on “Hip To It,” a primer on how to effectively play blues harmonica. Singer William G. Kidd may be unknown to many discerning blues fans, which will certainly change once they hear his compelling rendition of “This Time I’m Gone For Good”. Shellist makes an unaccredited appearance, his smooth tones a perfect contrast to Kidd’s pleading voice. Holiday takes over on lead vocal on two tracks. His rough-edged effort is a fine match for Harman’s “Three Way Party, “ as Kashmar and Shellist are back one more unaccredited time, adding stellar harp embellishments. The addition of a booklet with song credits, the order of solos, and accurate listing of contributions would have greatly enhanced this project. Burgin’s guitar messes perfectly with Andersen’s bass, giving Holiday a secure foundation to showcase his command of the vocal and harmonica on “Coin Operated Woman”. The title of this release might lead prospective buyers to think that this is batch of laid-back performances. Despite the scaled down accompaniment, many of the tracks pack a punch. No matter who is up to the plate, the music never falters. Thanks to Tony Holiday for a seductive sampling of the current state of blues harmonica. This is one that will get repeated listens.